Over the next few months we’re going to be treated to an endless slew of articles about Rick Perry that treat him as just another normal, garden variety presidential candidate. It’s going to be a master class in how fast the bar of crazy can get lowered. ….In Washington, Bachmann has shown no signs of letting up; if anything, the stakes have gotten even higher and the nation, under the stewardship of President Obama, has careened that much further along the road to ruin. 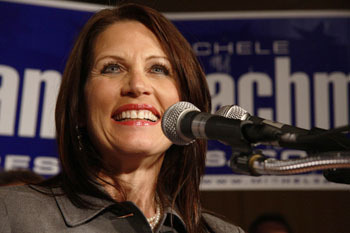 She’s made her mark by framing her opponents’ views in the most dire terms—charging that the Obama administration would deny conservatives health care, and that AmeriCorps, the Peace Corps’ domestic equivalent, is a forerunner for “reeducation camps for young people.” To Bachmann, the Obama administration is a “gangster government,” unmoored entirely from the biblically supported constitutionalism she’s espoused since her Oral Roberts days. Her rigid conservative dogma, an outlier at the outset of her first congressional campaign, has set the tone for the 112th Congress. Put simply, Dominionism means that Christians have a God-given right to rule all earthly institutions. Originating among some of America’s most radical theocrats, it’s long had an influence on religious-right education and political organizing. But because it seems so outré, getting ordinary people to take it seriously can be difficult. Most writers, myself included, who explore it have been called paranoid. ….We have not seen this sort of thing at the highest levels of the Republican Party before. Those of us who wrote about the Christian fundamentalist influence on the Bush administration were alarmed that one of his advisers, Marvin Olasky, was associated with Christian Reconstructionism. It seemed unthinkable, at the time, that an American president was taking advice from even a single person whose ideas were so inimical to democracy. Few of us imagined that someone who actually championed such ideas would have a shot at the White House. It turns out we weren’t paranoid enough. If Bush eroded the separation of church and state, the GOP is now poised to nominate someone who will mount an all-out assault on it. We need to take their beliefs seriously, because they certainly do. Read ’em both. And weep.